Please call True Cut Tree Care immediately at (248) 798-5909 if you have a tree emergency such as a downed tree, tree on your house, hanging limb, cracked tree or trunk or any other emergency or storm damage situation. We have a highly experienced crew dealing with hazardous and damaged trees and have the proper equipment to do what is needed. Whether we will need to use the bucket truck or a crane, we will get to your property as soon as we can to get the tree safely to the ground. If you have an emergency situation with your power lines, please call DTE to report the problem. 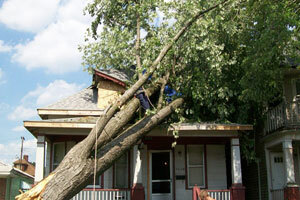 If they come out and remove a tree or large limbs that they leave behind, feel free to call us to remove the debris.